I have for a long time now been a spice-lover. From time to time, co-workers would drop off a little bottle of hot sauce that they picked up somewhere in their vacation travels. Cafe staff at work, when asked for hot sauce to complement their meal, on more than one occasion have directed their customers to my office. They all knew that there was usually a bottle or two of some exotic hot sauce with some crazy warning label, such as: "Caution: contents are 650 times hotter than jalapeno peppers." Clearly not for the faint of heart, as I observed one cafe guest throw out his lunch after disregarding my warning and applying too much Mega-Death sauce. Imagine my delight when a friend gave me a bag of ghost pepper chips! Wow! Ghost peppers were once said to be the hottest pepper known to man, though there are now a couple still hotter varieties. To compliment this already hot pepper, the ingredients label tells me that they also contain Cayenne Pepper and Chipotle Pepper. Perfect! If the ghost peppers don't kill you, the reserves of cayenne and chipotle peppers will drive the final nail in the snack food coffin. LOL. Love it! 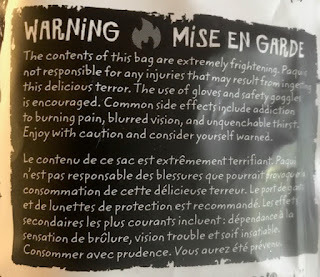 Like my previously mentioned hot sauces, this bag of awesome chips also comes with its own warning label. It's comforting to know that the manufacturer accepts no responsibility for injuries associated with my snack food cravings. 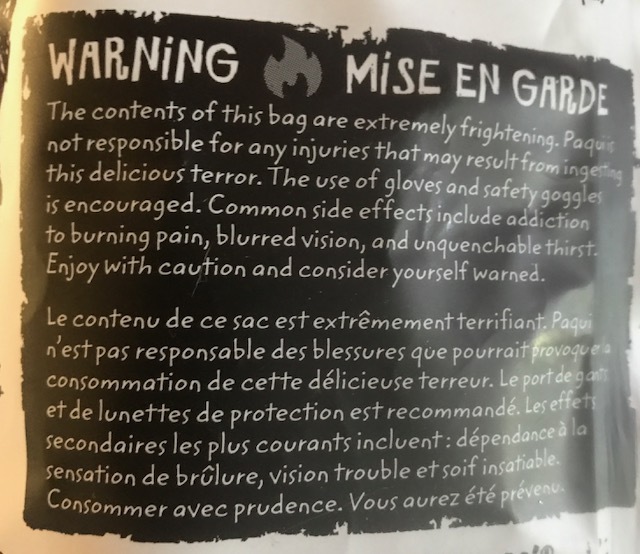 Interesting too to note, that the label speaks of "burning pain." After a few chips, I suddenly felt a bit of burning in the old sphincter. Coincidence? Hmm. So don't worry, be "Paqui," apparently an Aztec word meaning "to be happy." 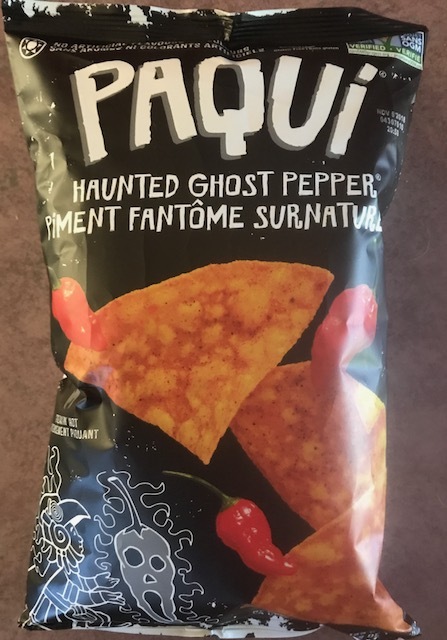 As for me, I can honestly say that I am "Paqui" to see that someone has finally come up with a snack chip to accommodate my love for heat and spices. All other pseudo-hot chips that I've tried thus far have failed miserably to satisfy. My only complaint is, as these hail from Austin Texas, I've yet to find these on the store shelves here in western Canada. What a shame! For more on this, visit paqui.com and discover the amazing ghost pepper chip. Postscript: If you've been brave enough to try these, drop me a comment; I'd love to hear your take on them. Likewise, if you've seen these on a Canadian store shelf somewhere, do me a favour and let me know. Peace. One day George and Frank, two factory workers, were talking to each other on their morning coffee break. George says, "I can make the boss give me the rest of the day off work." Frank replies, "And just how do you intend to do that?" George says, "Just wait and see." A little later George hangs upside down from the factory ceiling. The boss soon comes by and says, "What are you doing, George?" George answers, "I'm a light bulb." The boss then says, "You've been working so much lately that you're starting to go crazy!" 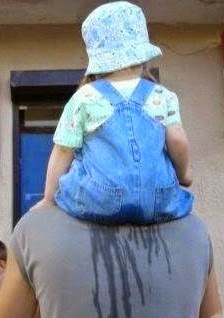 I think you need to take the rest of the day off!" George climbs down and starts to leave, and Frank promptly follows him. The boss says, "Frank, where do you think you're going?" Frank replied, "I'm going home too. 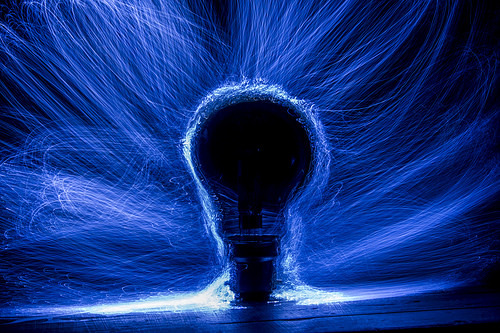 I can't work in the dark!"